*This post is essentially a compilation of work I’ve been spreading out amongst many different mediums, both here on this blog and elsewhere around the inter-webs. This also isn’t the most logically connected argument, I just needed a break from code. The first step to changing the ocean is to stop looking to it and instead step in. Properties of basic physics and hydrodynamics kick in and you are in effect changing the environment that you previous only observed. Instead of talking about the LMS, the MOOC market, or anything else that I often see learning designers discuss. Let’s skip ahead a bit. Let’s talk about the post LMS society that we wish to create. The how, where and why. How do we get to a post LMS era? 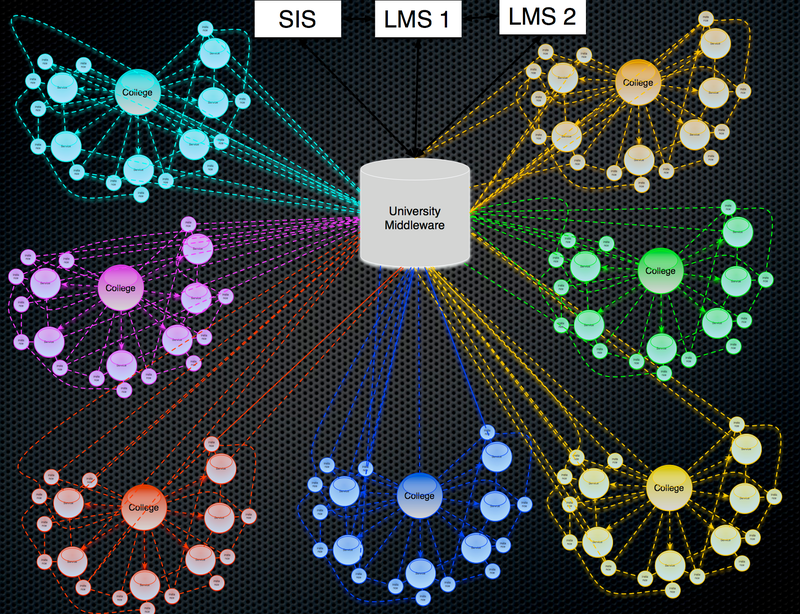 I’ve talked about what I felt would cause the eventual end of the traditional LMS before. Talk is cheap, so diagrams about how to accomplish this would be the next best thing, right? This video then goes on to show these diagrams produced as a fully functional prototype, with video introduction to the work. And this talk, which is a rebroadcast of my DrupalcampNJ presentation “Using Drupal to Transform Education” http://vimeo.com/60084560 consolidates the entire thing into one presentation. This is probably one of the more controversial statements that I stand by but typically don’t say. It shows my generally libertarian, small central authority mentality, for one, and for two: no one is doing anything but it. Come to us, we are the hub, we can provide everything you need in one place says every vendor out there, and the new MOOC platforms are simply replicating this model in a different location and calling it open. The structure needs to start at a central point but that center ring needs to be as small as sustainably possible. It needs to help knit things together and keep the “LMS” data that is currently stored in large buckets, spread out and accessible to new buckets (through a process of LTI resigning). This is where I’m hoping LTI will be the Trojan horse it appears to be, as someone noted at my talk in NJ (which I wish we had the audio of). So, you are advocating that people use these tools that you ship them off to and increasingly, they’ll use the LMS less and less. Eventually.. you’ll do so much outside the LMS that you won’t need an LMS anymore. Eureka, we have a winner. If we build enough off-ramps out of the system that while meeting some people’s needs, doesn’t meet everyone’s, we will eventually connect to other areas that people want to hang out. This pattern is quite similar to the western growth and expansion of America in the early 1800’s. People slowly were moving away from the major cities to parts unknown after the revolution. What changed that caused population migration to explode? Mike Rowe will have you believe it was booze, but I’d contend it was gold and rail-roads. Well gang, LTI is the railroad, and glittering prizes await those that create proper off-ramps for different tool sets that people are dying to get access to. Absolutely an issue. What happens when we start letting people go anywhere and everywhere? The same exact thing that happens now, we just introduce calculated risk instead of unknown risk. Innovation is happening with faculty every day, every where. This often times I’d guess is at the expense of telling others about it. The number of threads you can find on the Internet about cool new tools and different edtech applications is staggering. If we don’t provide a solution to new cool shiny object xyz, people will find a way around the systems in place to get students into the new bucket they’d like to use. So I’m doing my part to provide options, how bout you? These 4 tools are all being developed simultaneously (which completely wrecks me mentally some days, hence this brain dump of a post) but it doesn’t mean that all tools in a network NEED to be Drupal. It’s just to say that it’s the only system that a single developer could even attempt something this insane through automation. Actual drush command to build 183 drupal sites with a single command. Setting up a massively extended, LTI aware series of new buckets to be accessed after creation. This was a test run at the time of publishing. Course information system (ELMS:CIS) – Center point and middle-ware communications hub that bridges old world to the new one. Content tool (ELMS: MOOC) – The instructional design centric course outlining tool. This is the content outline that all instructional flow and material is attached to. Social critique tool (ELMS:CLE) – A completely free-form social submission space. Students openly submit and critique as well as receive instructor feedback in this space. This posting spends time detailing how and why to build this system. Interactive Course Object Repository (ELMS: ICOR) – A dumping ground of unique and interactive instructionally significant pieces of material. This could be polls, quizzes, time lines, slide-shows, content players, media, or really anything that might fall outside the norm that can be embedded as a widget in material via an iframe. Asset management system – (we already have this, but re-envisioned for today) and plugged into the LTI network. This would ideally be integrated with Red5 and FFMPEG for free media encoding and streaming (yes free) of video with secure delivery via RTMP. Copyright management spider – content production != copyright management on the fly. Often times these is a significant legal process that needs to happen in parallel to course development. Also, imagine a world where people are using resources and you have no idea what they are (like oh I don’t know… always). The copyright management spider is essentially a spider that crawls and ingests all courses in the learning network and digests them. Once digested, people go through and fill out all required legal information for the media, or help improve upon the earlier justifications for usage. Analytics engine – Something that sits off by itself and that all other tools can write to. I believe that a spec like TinCan seeks to achieve this but not sure. For the time being I’m writing logical chunks where I could tap in and send off relevant analytic data for processing by another system but haven’t done any work here yet. Interactive Rubric tool – We’ve built and used one through about 3 iterations of the tool, this would actually use LTI (and other Drupal system capabilities if in Drupal). It would also be optimized for mobile and responsive design. These are just the tools that I’m working on now or am envisioning for the future. Fortunately, there has been a lot of positive buzz around LTI and Drupal so I guess we’ll see. Ahh, mind is much clearer now that I’ve dumped all these ideas on to this adorable blogging platform.